While many comedies attempt to satirize topical subjects but tend to lean one way or another that ends up upsetting more one side than another, Dear White People is an example of one that offends onlookers that don’t care to actually watch the movie. Tackling the issue of race in today’s world is just like everything else- complicated. The film does what it sets out to do and make a point. Though how clear you’ll be by the end might vary. 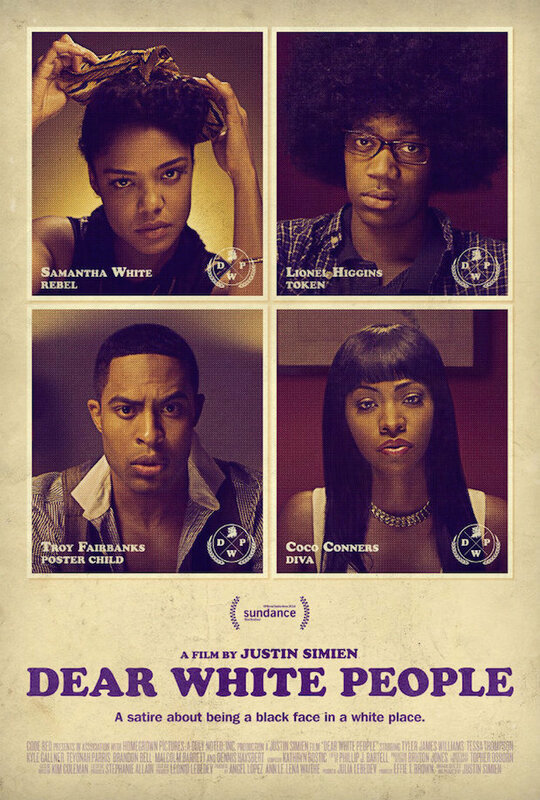 Seen through the eyes of four black students in a mostly white Ivy League school, the kids attempt to find themselves in a place full of people that seem to judge them based on one stereotype or another. But what can be seen as black and white isn’t nearly as clear when you’re actually living it. Descriptions don’t do it justice, not because it’s so complex and intricate but the real value of the film is the interactions of the cast. “Touchy” issues are dealt with in fast paced, witty style that needs to be in such a manner if the film is to get through it’s issues in the 100 minute running time. It’s a loaded topic for sure. The best thing that can be said about the film is it’s sardonic wit in dealing with a topic that will get people talking. Not much is meant to be looked at wryly while the ultimate goal seems to be to get viewers to raise questions and discuss the problems seen in the film that mirror those in real life. It’s interesting to note that a certain character insists that racial intolerance doesn’t exist while various forms of it are seen all over campus. So the problem is there, but not in a manner that’s nearly as obvious as one would normally think. The biggest problem Dear White People suffers from is that it seems to get distracted from its own point in the last act and certain ideals are lost if not for about fifteen minutes that seem to drag on, making you wonder where the film is headed at all. Though Gone Girl has received certain criticism for an ending that seems incomplete to many, it’s the type of ending that shouldn’t require spoon-fed exposition. Yet People could have benefited from a more clear cut finale. I can get behind the idea that since the issue isn’t clear cut, that’s where we’re left, but it seems nothing is wrapped up but an ending was needed all the same. Portions felt fitting enough while other aspects toward the end made much of the scenes leading up to it seemed almost pointless. Still, if awareness on modern day race relations and identity is what they want, awareness is what they’ll get. Whatever they’re looking at would probably offend somebody. Positives: Interesting issue handled humorously but not pompously. Much is covered in an hour and forty minutes. Negatives: The third act drags making much of the film lose its quick pace, the end is a bit choppy and unclear. This entry was posted on 10/23/2014 at 1:37 am and is filed under Reviews! with tags Controversy, Dear White People, Identity, movie review, Political Correctness, Race, Social commentary. You can follow any responses to this entry through the RSS 2.0 feed. You can leave a response, or trackback from your own site.